My friend Lisa and I were planning the menu for the Trott Brook wine dinner we co- hosted last week. 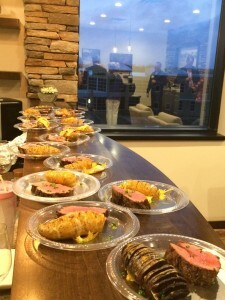 One of the courses included filet mignon and she mentioned that she would really like to have a horseradish sauce served with it. When I asked her what she put in her recipe, it was basically the same ingredients that I do, however I was out of sour cream, so I decided to use the creme fraiche that I had on hand instead. I’ve had folk ask what is the difference between creme fraiche and sour cream? Like yogurt, sour cream and crème fraîche are both dairy products produced with friendly bacteria, but while yogurt is made by adding those bacteria to milk, sour cream and crème fraîche are made by adding them to cream. 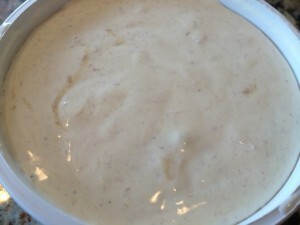 Creme fraiche is thicker and higher in fat and tastes rich and tart, where as sour cream tastes sour. I think crème fraîche tends to make other foods taste buttery. I also like horseradish, but in moderation. It is a perennial plant of the Brassicaceae family (which also includes mustard, wasabi, broccoli, and cabbage so it tends to be pungent). It is tapering root that is grated or ground to produce a condiment. It happens to contains a good amount of dietary fiber, vitamins, minerals, and anti-oxidants and has been found to have been anti-inflammatory, diuretic, and nerve soothing effects; but I don’t think these are the reasons people reach for it! It makes a great sauce! 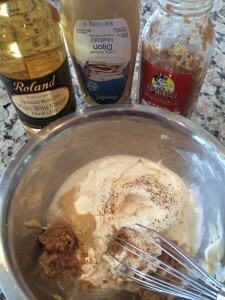 Together, they made a really easy and flavorful sauce for our beef! 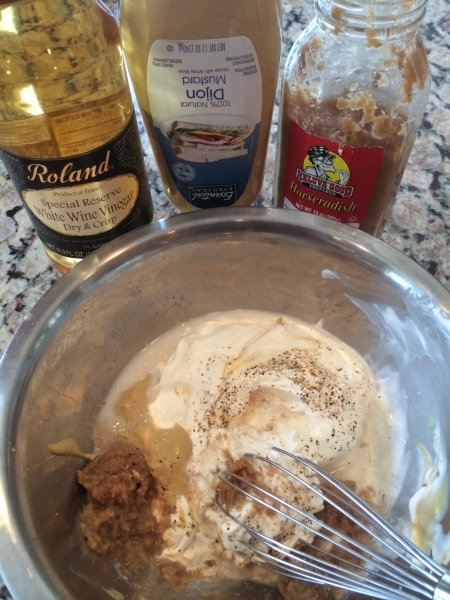 Place all of the ingredients into a medium mixing bowl and whisk until the mixture is smooth and creamy. Store in the refrigerator for at least four hours or overnight to allow flavors to meld before serving. We offered it with medium rare beef tenderloin that had been marinated in fresh rosemary and thyme, garlic and extra virgin olive oil. Simply delicious!